Why are there SO many IGs in Rescue? Living with an Iggy can be one of the most rewarding pet relationships you will ever know. It can also be one of the most frustrating if you don’t know what to expect! 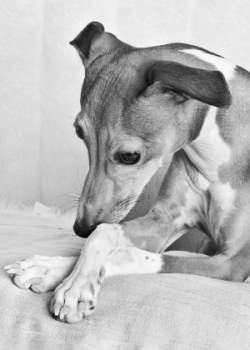 We have put together some materials to help you decide if an Italian Greyhound is the right dog for your lifestyle! Please read through the provided literature in the drop downs under the Life With An Iggy tab above and really consider if you are ready for the commitment that comes with owning an Italian Greyhound. Too Clingy-if you do not enjoy a dog that is velcroed to you at all times, this is not the breed for you. They sit on your newspaper or laptop while you drink your Sunday morning coffee, lay on your hair and stick their nose in your ear while you try to nap on the sofa, and attempt to join you in the potty because you are sitting and that means an open lap invitation in their eyes! When not invited into a room with you, you will likely trip over them when you open the door. They live to be with their human and are either at your feet, in your lap, or trying to get under the blankets with you all the time. At minimum, they expect to be within sight of you pretty much all the time. Poor House-Training- IGs are known for being difficult to housebreak, but it IS accomplishable with consistency, patience, and the understanding that you WILL be cleaning up an occasional accident. If Aunt Pearl’s priceless heirloom rug is going to be an issue-PLEASE consider another breed. Even a reliably house-trained IG may be in disagreement with going outdoors if it is rainy, windy, too cold, or if there is snow on the ground. Yelling at or ‘spanking’ this sensitive breed just makes the problem worse-in fact, they may begin associating these types of discipline with the act of using the bathroom at all which REALLY puts a monkey wrench in things when trying to teach them to go outdoors or on a pee-pad. You must be willing to tolerate an occasional accident. Sometimes we come across one that will brave the elements no matter what and would rather pop before soiling in the house, just not that often =) WE CAN HELP WITH POTTY ISSUES-please send a note through the CONTACT US tab and we will be in touch. But YOU must be committed, patient, and consistent for our advice to work. Older owner that can no longer handle the IG or keep him due to personal health issues-Italian Greyhounds live a LONG TIME. Most live well into their teens and there are not always family members available to take on an additional pet when their owner can no longer care for them. They also mature much later than other breeds. Many IGs do not ‘mellow out’ until they are around 3 or 4 years old. Mature owners are typically much happier with a low-key IG that prefers perching in a lap or lounging in a sunbeam for the greater part of the day as opposed to one that is bouncing off of furniture, jumping up and injuring fragile skin with their nails, squeaking toys non-stop, and needing ANOTHER walk to get rid of excess energy. New Baby-remember that ‘too clingy’ part? It doesn’t go away when the new tiny human joins the family. Your IG still feels the need to be in your lap TOO. They want to be part of EVERYTHING that their parents are doing, including caring for their new tiny human. It will also be important that you teach your growing child proper respect and handling of their IG sibling BEFORE there is already a problem with being too rough. If children are in your future, please consider this seriously.